While lots of us enjoy that idea, we’re just a little afraid of appliqué—though the results are undeniably lovely, the process seems time consuming and fraught with opportunities for error. Fear not! So that the scaredy cats amongst us can enjoy appliqué, too, Edyta’s come up with some products that will increase accuracy, save time, and still provide plenty of opportunities for creativity and fun. First came Silhouettes, individual laser-cut appliqué shapes with pre-applied, fusible webbing. 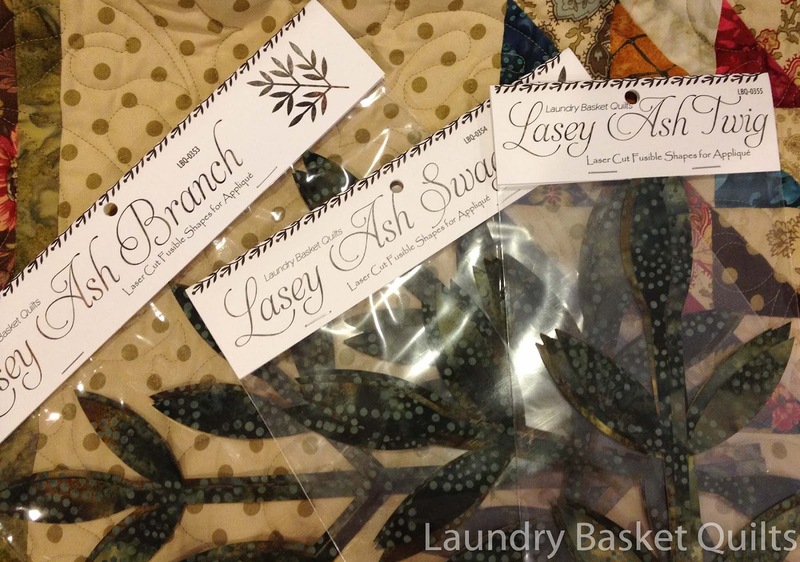 Recently Edyta added Laseys to her Laundry Basket Quilts line of products—similar to Silhouettes, they’re a larger, laser-cut piece of adhesive-backed fabric. Both come in fabrics that coordinate with Edyta’s lines for Moda, and new coordinates will be appearing this spring. Edyta first created Silhouettes to go with her Spring Bouquet quilt and is especially excited about the newest Silhouettes, due out this month, that will coordinate with her new Spring Sprouts quilt pattern. 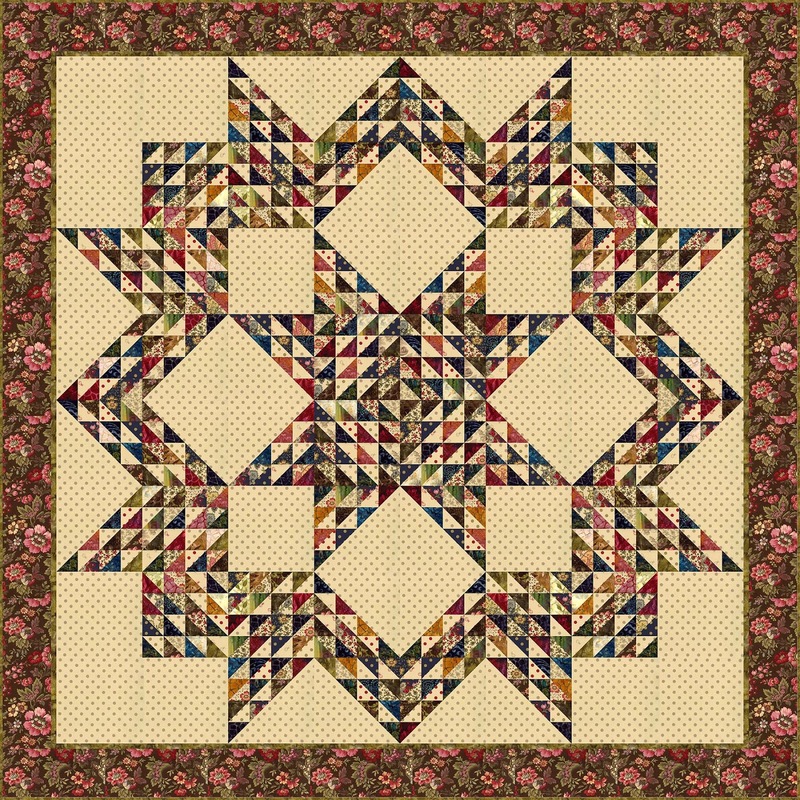 “Some people don’t have time to do a large quilt, so I designed this with smaller blocks and fewer pieces in each block—it can be a mini-block-of-the-month,” she says. 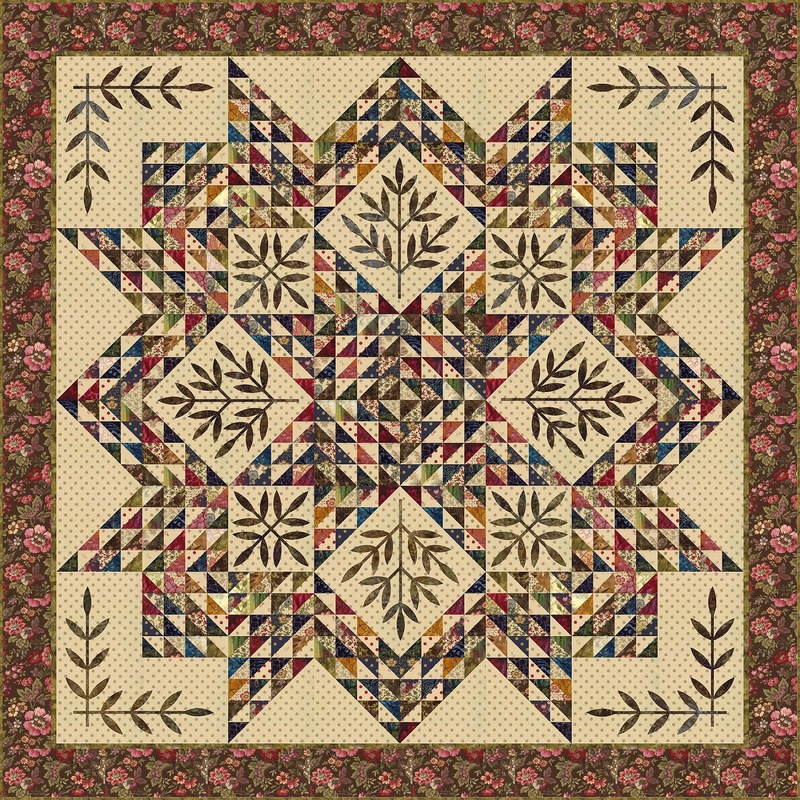 While Laseys and Silhouttes harmonize with Edyta’s patterns, they make great additions to any quilt project. Last spring she offered a Silhouettes challenge on her blog, and readers combined the pieces with buttons, embroidery stitches, and selvedges to create lampshades, purses, and pin cushions, along with table runners, pillows, and wall hangings. You can see photos of the projects here. There are also Silhouette letters for perfect for making banners to celebrate birthdays and the love of sewing. Edyta would like to share Laseys with one lucky blog reader. 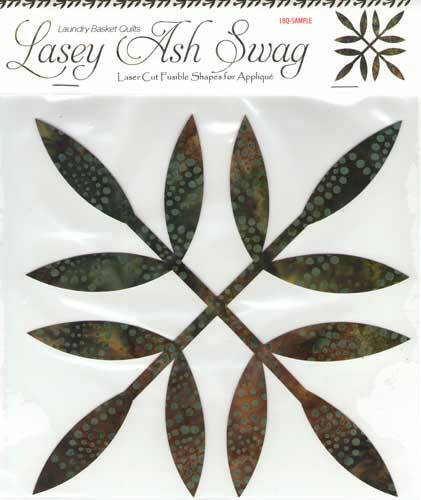 These Laseys coordinate with her Triangle Star quilt, but can be used in a variety of projects. 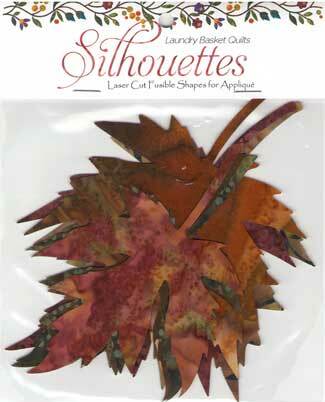 Leave a comment by February 6 about applique below and we’ll post the winner’s name on February 7. Next Next post: Why cut when you can SLICE!? Appliqué does intimidate me a bit, but I do love the results. I think this product would be fabulous to work with on a quilt project. Never thought about using invisible nylon thread on top with the cotton thread in my bottom. Thank you for the wonderful tip. I have not done much applique. I’ve never really been taught how to do good applique, so I have steered clear of working with it in the past. Thanks for the great tips. I love your work. You are such an inspiration to us all. Keep them coming. I saw a post last night about your new book can hardly wait. Your work is beautiful. forgot to say that I love applique.. but mine has all been freezer paper type so I am getting ready to start a project using the method of fusible web..
Would love to try out your Laseys.. thanks so much for a chance. What a great idea! I love the look of applique, but have not done much. I think this is just what I need to jump start my adventure! Oh how fun – applique always intimidates me – these are less intimidating! I have always loved combining applique with pieced blocks and just bought the applique silhouettes stencils and would love to see more stencils in the future. I always loved all sortes of applique and would be happy to win these silhouettes, impossible to find where I live ! I love the look of applique. I prefer turned edge but I really don’t have the time to do it and my results always look rubbish! I heard that the closest thing to turned edge on a machine is to sew slowly, turning under by hand and using a blind hem stitch but I’ve not tried it myself. I’m fairly new to applique. I’m still trying to find a method that works for me. I don’t have the hand control to do hand needle turn due to health issues. I have tried raw edge, the template / starch turned edge, glue & stick turned edge…but, none seem to produce the perfect effect. These laser cut pieces just might be the ticket if they don’t fray. Would love to try some! Love your Spring Sprouts pattern!! Thanks for the chance to win! I’d love a chance to win these Laseys and try my hand at some more. What a wonderful time saver. And so classy. I’ve only done a little applique – with bondaweb! Applique just adds that extra special touch of LOVE! to quilts. I love to applique, try to do little of it everyday. I really like Edyta’s patterns as I have several of them. Love applique but I never seem to get much done as it is so time consuming…would love to give the Lasey’s a try! I love Edyta’s patterns and these Lacey’s just add a whole other dimension!! Love them!! A great invention that makes a spectacular quilt more do-able for most of us. I especially like the triangle star quilt with the applique added. Beautiful quilts! Kudos to your for making your patterns accessible to all quilters. Applique can turn a lovely quilt into an over-the-top amazing quilt. 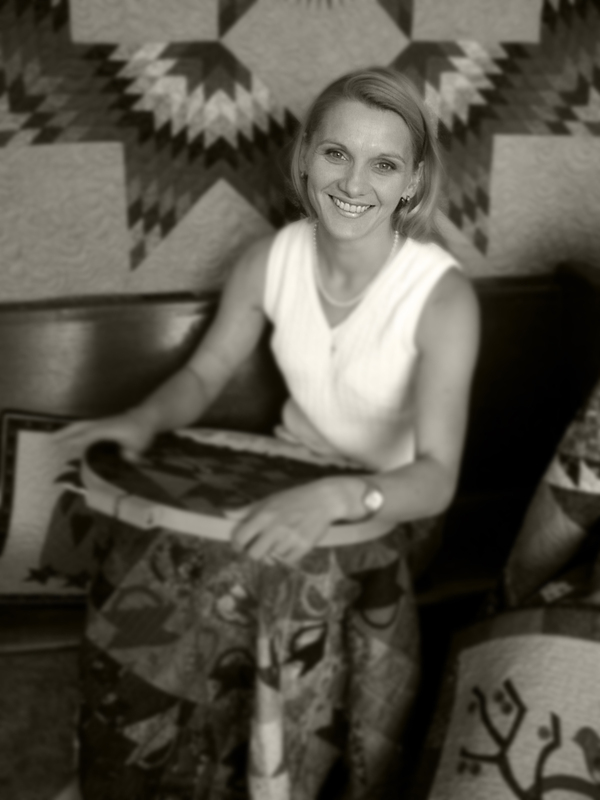 Edyta’s quilts are all masterpieces in my book. I am pretty intimidated by applique but love how it changes the look of a quilt. Thank you for this giveaway! Such pretty fabrics, I usually do a blanket stitch! This is the year for applique for me ~ I would love any and all tips and inspiration. Beautiful quilts. Thanks for a wonderful opportunity. This is the first time I have seen your blog thanks to MODA. I would love to try your method of Applique. I have not tried applique because I am scared to try it! Maybe now I will try it! Edyta makes applique less scarey, that’s for sure…it has been added to my bucket list! Love fusible applique but hate the drawing and cutting – these are perfect!!! Thank you so much for the opportunity to win them! When i saw a applique quilt for the first timw i thought that i never could done that. I just started with one and i am already addicted to applique. Applique was the first quilting technique I learned and I love, love, love it! Thank you for the chance to win! Oh my, I love applique. I have always begged my sister to do the applique portion for me in each quilt I make. However, 2 years ago she died suddenly. Well, I am so thankful I listened to her as she told me, “You can do it.” She was right and now I think of her as I make my own applique quilts. I hope I win ! I’ve only done a couple of applique projects..I do love it but hate, hate, hate drawing the pattern on the fusible then cutting the pieces out. This seems the perfect solution to my problem. So I would love it if you could send some my way. I enjoy hand applique of very simple projects. These look interesting – I’ve never tried iron-on applique. I love to do hand and machine appliqué! These Laseys look like a nice shortcut when adding so many leaves and stems. 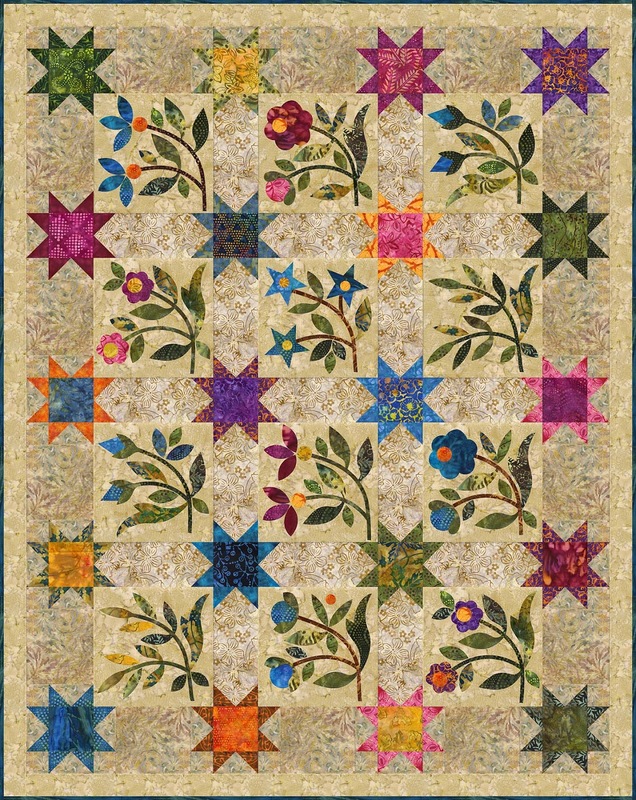 Love the Triangle quilt with the leaves. You could add whatever florals you wanted with the leaves done quickly! I’ve only been making raw edge applique projects in the past year or two and just love it. I’ve seen Edyta’s work in person and it’s fabulous! I LOOOVE the look of applique but do not like the tracing/cutting of all the bajillion pieces. So your new Sihouettes ane Laseys are PERFECT! Thank you for a chance to win some! I have admired your quilts since you began and they are all wonderful! Don’t love the idea of cutting all of those teensy little pieces perfectly, now if you are offering to do it FOR me.. bonus!! Oh that quilt of hers is a delight with the addition of these pieces! I didn’t want to applique when I first began quilting but now I love it! I have several applique projects in progress now. Wonderful idea of making applique easier. I’d love to give it a try. Now that I’m getting older, I find my arthritic hands and fingers find nice applique an impossibility. I’ve switched to the iron-on method. Your laser cut appliques seem like the ticket! Blessings on you and your family. I love applique. The Laseys seem to make applique easier. They add a sophisticated look to a quilt. I’ve always been intimidated by applique, but I love these designs. 2013 is going to be my year to learn! Thanks for the chance. Love the look of applique but have not had the time to learn it! The Laseys maybe the trick to get me there! I love appliqué but just don’t have time to stitch it by hand. Her fusible method looks very doable! Can’t wait to try it. I love these laser cuts. I completed a table runner using these pieces and am looking forward to doing another project soon. Thanks, Edyta. Thanks for this great idea. I always loved all sortes of applique but I had done a few of my projects with applique. I stitch it by hand using blanket stitch. I love the look of applique though I’ve only done machine applique. I do love Edyta Sitar – I have a winter table topper kit of hers that I must get going on. Applique is a little scary but it add so much to a quilt. Your pictures sure show the difference it makes. I love to appliqué and I mostly needle turn. I would love to win these. I keep trying appliqué. One day it may come easy to me. I haven’t tried fusible applique yet. These would be a great way to try it out! I’ve just completed two small applique projects, and they say “practice makes perfect”… I don’t know if practice will, but I suspect these two products could!… it makes sense that there should be such a thing! These sound like wonderful ways to help those afraid of applique to give it a try. Bravo! Edyta has designed some intricate applique quilt patterns that intimidate me, even though I love hand applique. Her “laseys” make intricate applique very doable. I don’t mind doing applique at all but then it isn’t done by hand – yet. This product sounds real intriguing and wouldn’t mind trying it. Another on the to do list! Thanks for sharing. I would LOVE to try this product. Cutting out applique is my least favorite step, and the laser cut edges would be great! I Love Edyta’s quilt. I have always appliqued by hand, maybe it’s time for a change. Would love to win, thanks for the chance. I have the Spring Sprouts pattern but have been waiting for time to make the quilt. Winning the Lasey’s would certainly jump start the process. You had my attention with laser cut and don’t fray. Really? That would be heaven. I love the look of appliqué, but I’ve been afraid to try much more than a few pieces. I was a participant in Edyta’s Silhouette challenge. I had never used the Silhouettes before, but I was oh, sew, sew pleased with my project. I made the purple coneflower pincushion. I blanket stitched around each petal. I just love these Silhouettes and this technique. Edyta is sew, sew talented! I love appliqueing – these look fun – usually my applique is a tad wobbly as cutting them out myself isn’t the best. Laser cutting sounds great. I love the looks of applique but I’ve never been able to accomplish it. I have watched Edyta’s tutorials and would love to try her method. I love applique but find it frustrating. I’d love to give this a try. Thanks for the chance to win. My goal this year is to do an applique quilt. Didn’t know about Lasey’s, but will definitely learn more about this product before starting my quilt. Glad I found this post. Thank You! Oh, my, but this is beautiful! It’s just what I need! (Love the look of appliqué, but it takes me soooo loooonnnnggg to draw/cut/sew!) Thank you for removing all my appliqué stumbling blocks! I am new to applique…love the difference it made in the star quilt. I would love to give these a try…thanks for the chance at your giveaway. I have discovered that I love needleturn applique. I haven’t really tried too much of the raw edge, but if I did, I would use Edyta’s laser cuts. Thanks for the chance to win some. I do all my appliqué by hand. I might try buttonhole stitch on these. I love applique, both needle turn and fusible raw edge methods. The prep time is the only negative for me and this product would solve that problem! I would love to try these out and get to the fun, creative part quickly! Thank you for the giveaway. These could be the beginning of my success story as an appliqué master! I’ve a long way to go to reach that status, having completed just one appliqué quilt this past year. But I will make more. The bug has bitten me! I have come to love all kinds of appliqué, too and would love the opportunity to play with Edyta’s Silhouettes. Applique adds so mush to a quilt! It can take the quilt from a lovely crafted item to an awesome heirloom or a piece of art. Thanks for the giveaway opportunity!